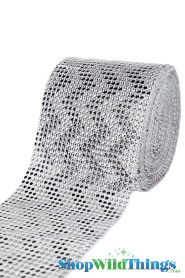 Our new White with Silver Chevron Diamond Wrap Rolls are bendable crystal mesh that can be trimmed to any length, width or shape that you desire! 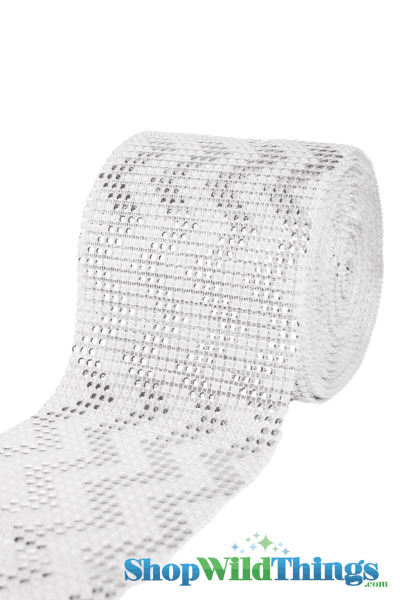 The sparkling silver and the pearly white zig-zag design will add awesome visual appeal to your project and each roll is 4.5" wide by 30 feet long! It's very easy to work with and add to candles, vases, cake and cupcake stands, around floral arrangements and more. Each "diamond" is 1/8" in diameter. This stuff really looks like there are gemstones on top but it's an optical illusion, the "diamonds" are actually concave cut-outs. Great stuff at a great price! You can even save the leftover trimmings and bling out whatever you choose. We've just bedazzled our calculators (and our scissors, and our tape guns, and our measuring tapes....) with some leftovers. FUN FUN FUN! 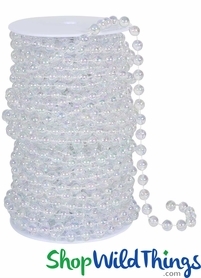 Attach the Diamond Wrap Rolls to your item by using double sided tape, safety pins, glue or thumbtacks.